This delicious roasted vegan cauliflower cheese recipe is dairy free, keto, gluten free and uses butter beans as a base. This means it’s high in both protein and fibre. A great comfort recipe that is low in carbs, low in fat and free of oil. If you want a creamier cheese sauce then you can add a few tbsp of a cold pressed oil like olive oil. The cauliflower is dry roasted to give a golden colour and a grilled taste. As no oil is used you need to keep a sharp eye on the oven when the cauliflower is roasting so it’s taken out at exactly the right moment. If the cauliflower starts to burn this can give a bitter taste. You can steam the cauliflower if you prefer, but I think roasting gives a better taste as it’s less watery. Whole sesame seeds are used to give a creamy sauce but they also add calcium and magnesium to this dairy free cauliflower cheese dish. The sun-dried tomatoes add salt to the dish. If you don’t have any just replace with a pinch of salt. Serves 2 as a main or 6 as a side dish. This healthy cauliflower cheese is suitable for vegan/dairy-free, paleo, grain-free, keto, gluten-free and oil-free diets. The sesame is used in this to give some heart healthy fats and taste. I know many are allergic to sesame or don’t like it and the vegan cauliflower cheese recipe works just as well without it. Nutritional yeast is the star of the show as it gives a cheesy and nutty taste while also adding lots of B vitamins. It’s got an unfortunate name so some call nutritional yeast nootch or hippy dust. You can make it without nootch if you can’t get hold of any but the taste will be missing something. A tablespoon of yeast extract like vegemite or marmite is a good substitute. I often adapt this recipe to add some almonds or cashew nuts. This makes it a bit more creamy with some healthy fats and extra protein. 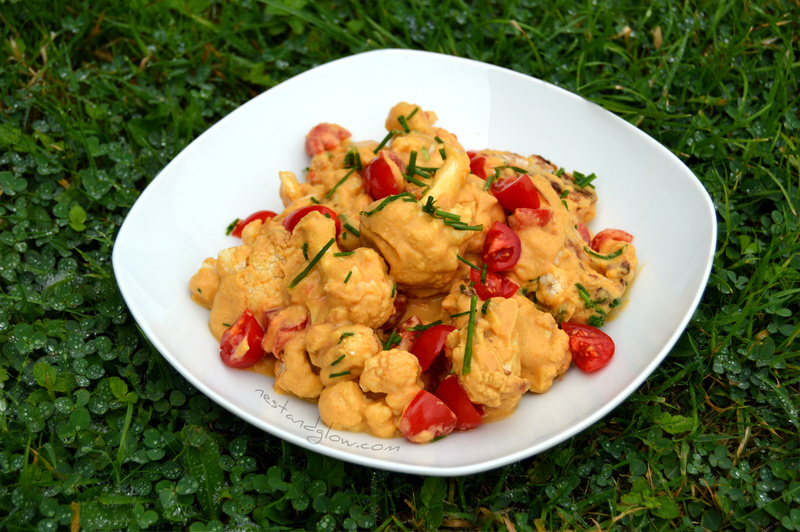 I didn’t use nuts in the original recipe just to make a dairy free cauliflower cheese that’s a bit different to other recipes. It’s free of cashews as its all too easy to include them in every vegan cheese dish. For a vegan cheese check out my popular smoked cashew cheese recipe. This vegan cheese recipe is firm so slices and grates! Cut the stem off the cauliflower and break up into bite size florets. Place these on a lined tray and bake at 200°C 400°F for about 20-25 mins until the cauliflower starts to go golden brown. Add the butter beans, sesame, garlic, turmeric, nutritional yeast sun-dried tomatoes and water to a blender and blend until you get a smooth vegan cheese sauce. You may want to adjust the water in the cheese sauce depending on how thick/runny you like it. 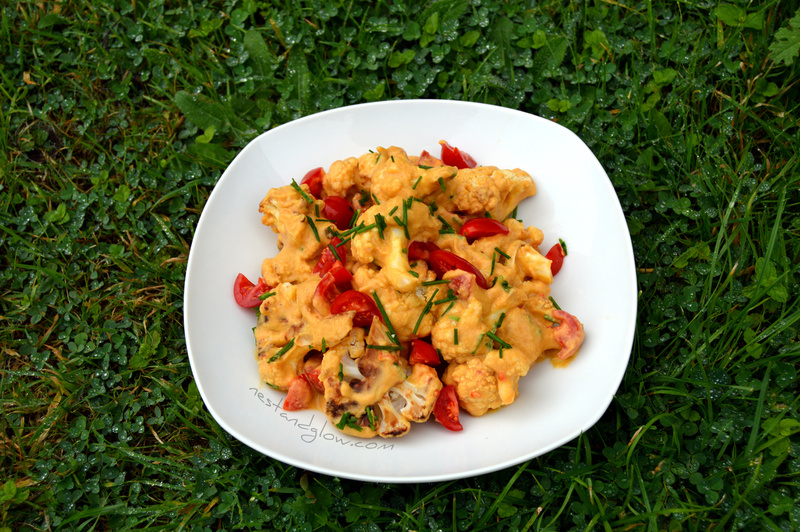 Mix the roasted cauliflower with the cheese sauce and top with quartered cherry tomatoes and chives for your vegan cauliflower cheese. This cheese sauce also makes a great vegan cheesy pasta. Remember not to throw away the cauliflower leaves as they are edible and full of vitamins – just as healthy as kale! Make them into a cauliflower leaves stir-fry. 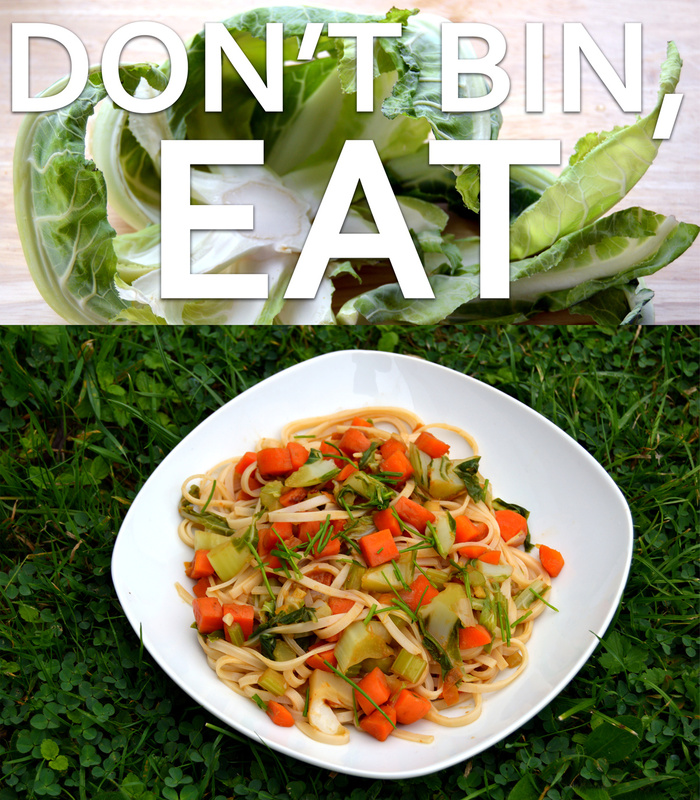 Hey friends, a few tips if you’re gonna use this recipe! I would not use 2 cups water – I used maybe 1 and 1/3 and it was good! I also added more nutritional yeast, tumeric, and garlic, along with my own additions of onion powder, pepper and paprika. I also heated the sauce up before putting it on. I would say put all the sauce ingredients in a pot – then add the tomatoes and chives and heat everything up! Thought it was nutritious and delicious with those tweaks!! Sounds good, the measurements are a bit rough as a single clove of garlic varies in size massively! In our recipes one tbsp is always heaped if it is non-liquid. Glad that you tasted it as you went and adjusted accordingly. Amazing recipe! This cheese sauce was pure perfection and very tasty. Would Sesame Oil work instead of Sesame Seeds? Can you substitute the butter beans?